Level sensing checkweighers, or level sensors, are designed, not to check the weight of a product or package, but to check the level of fill of a product within a clear or opaque product container or package. Usually with a transparent or clear package, a series of photo-electric eyes with a control package are sufficient to sense the level of fill and detect over-fills or under-fills. For opaque containers, the technology behind a level sensor is more complete. Some level sensors use x-rays or gamma rays to detect the level of fill within an opaque container. Gamma level sensors generate energy beams of gamma rays and pass the rays though the package. The energy wave of the gamma ray is unaffected by the relatively thin packaging material, but when the gamma ray passes through the more dense product, the gamma ray is distorted. Sensors on the far side of the level sensor capture the gamma rays that have passed through the container. By comparing the information from the sensors to an expected known, the level sensor is capable of determining if the container is in an under-fill or over-fill condition. Filtec Model JR FT-50 system was used for profiling of candy bars, at 325 ppm in conjuction with a horizontal wrapper and automatic cartoner. 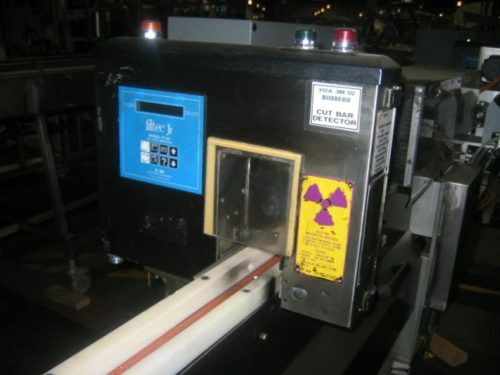 Has a Filtec off registration, or open product detector system with a 5" W x 8" H apature, and uses a small gama isotope to insures proper detection wrapper is running bars on registration, and not with open ends, microprocessor electrontics with operator interface touch pad controller, LED readout, S/S enclosure, mounting bracket, statis and alarm lights with bad product air reject system.